Stan Musial was honored, along with 14 others in a ceremony this afternoon at the White House, as he was given the Presidential Medal of Freedom. 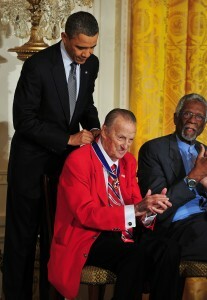 Musial, along with former Boston Celtic star Bill Russell, was one of two athletes honored by President Barack Obama. President Obama talked not only of Musial’s on field performances and numbers over his entire 22 year career with the Cardinals, but also pointed out that in the prime of his career, Musial stepped away from baseball to serve our country during WWII for one year in the U.S. Navy. A touch of irony that President Obama mentioned Musial was the first player to ever make $100,000 in a season. This comes the day before Albert Pujols’ self-imposed deadline for contract talks with the team, when rumors are surfacing that today’s star could be asking for $30 million a year from the team.